Baseline surveys form the cornerstone of coastal impact studies where altered conditions, for example through new infrastructure development, are assessed against a temporal reference state. They are snapshots taken before construction. Due to scarcity of relevant data prior to baseline surveys long-term trends can often not be taken into account. Particularly in heavily modified waterbodies this would however be desirable to control for changes in anthropogenic use over time as well as natural ecological variation. Here, the benthic environment of an industrialized embayment was investigated (Swansea Bay, Wales, UK) where it is proposed to build a tidal lagoon that would generate marine renewable energy from the tidal range. Since robust long-term baseline data was not available, the value of unpublished historical benthos information from 1984 by a regional water company was assessed with the aim to improve certainty about the persistence of current benthic community patterns. A survey of 101 positions in 2014 identified spatially discrete benthic communities with areas of high and low diversity. Habitat characteristics including sediment properties and the proximity to a sewage outfall explained 17–35% of the variation in the community structure. Comparing the historical information from 1984 with 2014 revealed striking similarity in the benthic communities between those years, not just in their spatial distribution but also to a large extent in the species composition. The 30-year-old information confirmed spatial boundaries of discrete species associations and pinpointed a similar diversity hotspot. A group of five common species was found to be particularly persistent over time (Nucula nitidosa, Spisula elliptica, Spiophanes bombyx, Nephtys hombergii, Diastylis rathkei). According to the Infauna Quality Index (IQI) linked to the EU Water Framework Directive (WFD) the average ecological status for 2014 was “moderate,” but 11 samples showing “poor” and “bad” status indicated possible negative impacts of dredge spoil disposal. Generally the study demonstrated the value of historical information for assessing the persistence of benthic community characteristics, while also highlighting shortcomings if raw data is lost and if the historical baseline does not reflect pristine ecological conditions. Coastal infrastructure such as seawalls, breakwaters, or jetties impact marine ecosystems (Bulleri and Chapman, 2010; Firth et al., 2013). In recent years there has been growing demand to build marine renewable energy devices, contributing to even more infrastructure (Wilson et al., 2010; Binnie, 2016). In order to assess its environmental impacts developers have to carry out baseline surveys of the diversity and composition of benthic communities in the affected area (Franco et al., 2015). However, these are just snapshots of the situation immediately before construction and questionable long-term reference states. Baseline surveys may be affected by short-term natural impacts such as severe storms, extreme temperatures or unusual riverine freshwater input due to heavy rainfall, or anthropogenic impacts such as maintenance dredging (Kröncke et al., 1998; Bolam et al., 2010; Rangel-Buitrago et al., 2016; Robins et al., 2016). For the baseline to be a critical reference point it ought to establish the long-term condition and patterns of the benthic communities. Ideally, environmental monitoring data from statutory bodies or scientific research can be consulted, but long-term data is often scarce or non-existent or the spatial resolution is insufficient to serve as a suitable baseline. In those cases, where present, historical information may provide a valuable source of information. Marine historical ecology contributes profoundly to our understanding of the coastal environment and is increasingly applied in long-term management and policy (Robinson and Frid, 2008; Engelhard et al., 2015). Generally, historic data provides information on past baselines of biological and environmental parameters and enhances our understanding of the effects of anthropogenic disturbances on marine ecosystems and the role played by humans in shaping our coastal habitats (Lotze et al., 2006). Currently the construction of a tidal lagoon is proposed for Swansea Bay (Wales, UK), a coastal area considered to be a “heavily modified waterbody” under the EU Water Framework Directive (WFD; 2000/60/EC) as a result of coastal protection measures (Figure 1). Under the WFD Swansea Bay's predicted ecological quality is classified as “Bad Potential.” The proposed lagoon would exploit the tidal range to generate 320 MW using bulb turbines and power 155,000 homes (Waters and Aggidis, 2016). The wall would be 9.5 km long enclosing 11.5 km2 of foreshore and seabed. As part of the environmental impact assessment (EIA) to inform the planning consent the developer had to carry out a baseline survey, but long-term information about the benthic communities in the area over recent decades was sparse (Harkantra, 1982; Shackley and Collins, 1984). Suitable historical information for a long-term comparison of benthic communities was located in an unpublished report (Conneely, 1988). In 1984 the regional water authority took 172 benthos samples throughout Swansea Bay to fulfill legislative requirements to protect the natural environment from adverse activities and the need to prepare a discharge policy; the area bordering the bay was, and still is, heavily industrialized and there were a number of domestic sewage discharges (Chubb et al., 1980). The survey was a data treasure chest that could be used to assess long-term changes of benthic community patterns. Since 1984 Swansea Bay experienced changes in its anthropogenic use, for example, a major sewage discharge was closed and relocated in 1999 and some areas were used for mussel cultivation, and these activities had had measurable, localized impacts on benthic communities (Smith and Shackley, 2004, 2006). Over the past decades the shipping channels to Swansea and Port Talbot ports as well as the River Neath were regularly dredged, and the material was discarded at a spoil ground in the outer Swansea Bay area (Figure 1). Figure 1. Swansea Bay study area, Wales, UK (51.6197° N, 3.9311° W). Benthos grab-sampling positions in 1984 and 2014 are shown as well as the outline wall of the proposed tidal lagoon, the sewage outfall and the dredge spoil disposal site. In 2014 the wider Swansea Bay area was surveyed with a sampling design similar to 1984, and the data was analyzed in the same way as reported by Conneely (1988) for the historical study. The raw data from 1984 had been lost, and hence the comparison between 1984 and 2014 was limited to the figures and tables shown in the historic report. Fortunately the author had applied several techniques which are still valid today, including multivariate community analyses, but for the 2014 data additional analytical tools were applied. • Identify current benthic communities in Swansea Bay, characterize their spatial identity and species composition and quantify the extent to which the benthic fauna was driven by habitat characteristics. • Compare current benthic community patterns with those 30 years ago. • Assess the current environmental status of the benthic community with indicators accepted by the WFD. Swansea Bay is a shallow embayment on the northern coastline of the Bristol Channel (Wales, UK) with depth generally < −20 m Ordnance Datum (OD; Pye and Blott, 2014). It is exposed to severe hydrodynamic forces due to strong winds and tides generated in the Bristol Channel, as well as North Atlantic swells (Allan et al., 2009). Swansea Bay is characterized by a complex patchwork of bottom substrata (Collins et al., 1980). It consists of depositions of poorly sorted, consolidated glacial boulder clay (glacial till), pebbles and cobbles, sometimes mixed with unconsolidated mud and silt as well as mixed sand, silts and clays with associated peats (Culver and Bull, 1980). Marine sediments in the eastern Swansea Bay area are mixed with re-distributed dredge spoils from the Swansea and Port Talbot docks (Culver and Bull, 1980; Shackley and Collins, 1984). Generally, surface sediments are highly temporarily variable depending on storminess, with an increase in the proportion of sand and the exposure of relic gravel deposits after periods of wave exposure and deposition of mud following calm weather (Shackley and Collins, 1984). Water quality is largely influenced by the hydrology of three river catchments that serve Swansea Bay. It is also influenced by the historical and current industrial activity and associated diffuse and point pollution (surface water run-off) toward the eastern side of the bay. The main sewage outfall for the wider Swansea area is located in the center of the inner bay (Figure 1). In 1984 benthos samples had been collected in a 1 km2 sampling grid in the wider Swansea Bay area, and the same design was adopted in 2014; the reported figure of sampling points in 1984 suggests that the 1 km2 grid design was only partly realized (Figure 1). Altogether 272 sites were visited in 1984, but glacial till limited the number of successful faunal samples to 176. At each position a single sample was taken. In 2014, 129 positions were visited and more samples were taken closer to shore compared with 1984, but fewer samples further offshore due to logistical limitations. Bed rock, boulders, or large shells prohibited the jaws of the benthos grab to close at some positions and here sampling was unsuccessful. Successful benthos samples were retrieved at 101 positions. Benthos samples were taken with the same 0.1 m2 Day grab in 1984 and 2014. About 200 g of surface sediment were removed for particle size analysis, and the remaining sediment was washed through a 1 mm sieve. The amount of sediment in each grab sample varied between 3 and 10l. Benthic community parameters were correlated with the amount of sediment per grab sample to test for possible effects of sediment volume on benthic community results, but it had no statistically significant impact (DistLM, p > 0.05). The sieve residue was fixed in 4% formaldehyde and stained with Rose Bengal. All benthic species were sorted from the samples, identified to species level and counted. Sediment samples were air dried and passed through a series of sieves from 2 mm to 63 μm according to the Wentworth–Udden classification scale to determine particle-size distribution. The sediment parameters mean grain size (x¯), sorting (σ), skewness (Sk), and kurtosis (K) were calculated with GRADISTAT (Blott and Pye, 2001). Taking a single sample at each position without replication allowed using available resources to achieve a high resolution in the spatial spread of sampling positions, but it carried the risk that individual sites were not sampled representatively. It was therefore important not to place too much importance on results of individual sampling points, but rather consider groups of sampling points and broader spatial patterns. All information of the 1984 study was taken from Conneely (1988). Scanned copies of key figures and tables in the report are provided as Supplementary Material S1. In 1984 as well as 2014 groups of samples with a similar benthic community were identified by cluster analysis based on Bray–Curtis similarities and group average (Clarke and Warwick, 2001). In order to down-weigh numerically dominant species, the data was ln(x+1) transformed in both studies. For 1984 clusters were identified from the dendrogram shown in Conneely (1988) (Supplementary Material S1). For 2014 clusters were additionally analyzed by the “similarity profile” (SIMPROF) permutation test in PRIMER (Clarke et al., 2009). This explores the evidence of statistically significant clusters in samples which are a priori unstructured. For the 1984 survey Conneely (1988) determined indicator species of the sample clusters by a set of “pseudo F-tests” (Mirza and Gray, 1981), and the method was replicated for the 2014 data. The test is “pseudo F” because it is applied to groups of samples determined by cluster analysis and not to pre-defined, independent sets of samples. Species that are significantly different between clusters in terms of abundance are considered useful discriminators between communities. There are potential pitfalls of such an approach, such as violation of the underlying assumption of normality and multiple comparisons problems, and therefore an increased chance of type I and II errors. The pseudo-F-test is rarely used these days to identify species that discriminate groups of samples. Instead, one of the most widely used methods in benthic community studies is SIMPER, which examines the contribution of each species to the average resemblance between sample groups (Clarke and Warwick, 2001). SIMPER additionally determines the contributions of species to the average similarity within a group of samples and hence identifies the species that typify a group; this analysis does, however, not identify discriminator species. For the 2014 data both methods, SIMPER and pseudo F-test, were applied. Identifying indicator species by pseudo-F tests and SIMPER was not directly comparable since SIMPER contrasts pairs of clusters, while pseudo-F compares all clusters simultaneously. It was however possible to broadly assess the resemblance of the species identified by the methods as discriminator species. Associations of species with similar spatial distribution were identified by inverse classification for 1984 and 2014. Two species are thought of as similar if their numbers tend to fluctuate in parallel across sites. Conneely (1988) had performed an inverse cluster analysis based on Bray-Curtis species similarities and reported the species associations for 1984, and the same analysis was carried out for the 2014 data. The Sørenson Index was calculated between species association identified for 1984 and 2014 to assess the similarity between them over time. The extent to which habitat characteristics could explain the multivariate community structure found in 2014 was explored by distance-based linear models (DistLM). The routine allows analyzing and modeling the relationship between a multivariate data cloud, as described by a resemblance matrix, and one or more predictor variables (Anderson et al., 2008; PERMANOVA+ for PRIMER software). DistLM provides quantitative measures and tests of the variation explained by the predictor variables. The sediment properties mean grain size (x¯), sorting (σ), skewness (Sk), kurtosis (K), % coarse sand and silt/clay were included as variables as well as depth. Distance of each sampling position to the mouth of the rivers Tawe, Neath, and Afan was entered as a proxy for exposure to freshwater. This was calculated as a cumulative factor weighed according to the size of the catchment: River Tawe 49%, River Neath 32%, River Afan 19%. The distance to the sewage outfall was entered to quantify the impact of nutrient enrichment and point-source pollution. Before DistLM regression was carried out a Draftsman plot was evaluated for multi-collinearity and skewness of data. The Draftsman plot indicated strong correlations between some of the sediment parameters, but r was always below the usual cut-off point of 0.95. Hence, all variables were entered into the model, but it was kept in mind that inter-correlations may render some sediment characteristics redundant as explanatory factors. AIC was used as selection criterion since, unlike R2, it will not necessarily continue to get better with increasing numbers of predictor variables in the model; a “penalty” term is included in AIC for increases in the number of predictor variables (Anderson et al., 2008). Results of the DistLM were visualized by distance-based redundancy analysis (dbRDA). A vector overlay was added to the ordination diagram of the dbRDA, with one vector for each predictor variable. The IQI was developed to assess the ecological status of the macrobenthic invertebrate infaunal assemblages of sediment habitats in UK coastal and transitional water bodies for the WFD (Phillips et al., 2014). It is a multi-metric index that expresses the ecological health of benthic assemblages as an Ecological Quality Ratio (EQR). It is composed of three individual components: AZTI Marine Biotic Index (AMBI), Simpson's Evenness (1–λ'), and number of taxa (S). To fulfill the requirements of the WFD, the IQIv.IV incorporates each metric as a ratio of the observed value to that expected under reference conditions. For reference conditions sediment properties were entered for each sample. Salinity was standardized to 28 for positions closest to rivers, 31 for other positions in the inner Bay and 32 in the outer bay south of Mumbles Head; salinities were averaged from data provided by Natural Resources Wales. The resulting EQR ranges from an ecological status “High” (no or very minor disturbance) to “Bad” (severe disturbance; Phillips et al., 2014). It was calculated with the IQI Calculation Workbook UKTAG v.1: update 11/03/2014, which is freely available from the WDF UKTAG webpage. For the 2014 study 188 benthic species were identified from 101 infauna grab samples. The multivariate benthic community analysis comparing all samples classified 21 clusters, and these were grouped into six broader clusters of samples (SIMPROF test based on Bray-Curtis resemblance matrix). The similarity within each of the six clusters was 23–38% (SIMPER). Cluster 1 covered most of the eastern side of Swansea Bay (Figure 2). It was characterized by typical fine-sand species such as the bivalves N. nitidosa and S. elliptica, the polychaetes S. bombyx, and N. hombergii, as well as the cumacea D. rathkei. Figure 2. Benthos associations in Swansea Bay delineated by hierarchical cluster analysis based on Bray-Curtis similarities between samples. The 1984 map was adapted from a figure reported by Conneely (1988) (Supplementary Material S1). 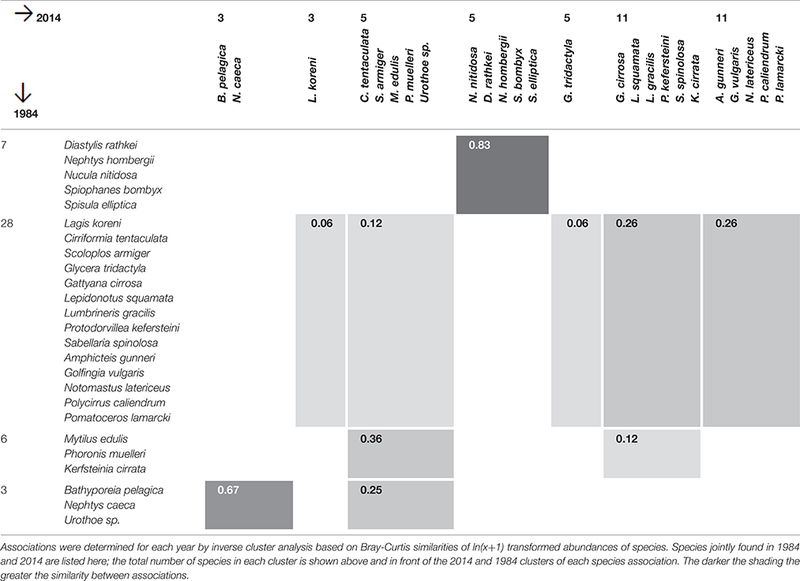 Cluster 2 at the western side of Swansea Bay off Mumbles Head was the most biodiverse cluster with almost four times as many species and five times the number individuals compared with cluster 1 (Table 1). While clusters 1 and 2 had several species in common these were still discriminating the clusters since most species were more abundant in cluster 2, except N. nitidosa and D. rathkei. Additionally encrusting, sessile, tube-dwelling polychaetes, sipunculids, and phoronids, as well as fully marine species such as the brittle star Ophiura ophiura colonized the area grouped as cluster 2 (SIMPER; Table 2). Table 1. 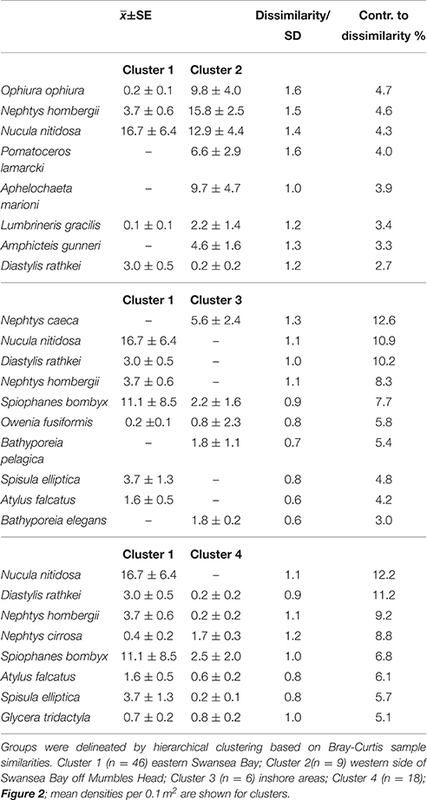 Diversity and abundance (0.1 m−2) within clusters delineated by hierarchical cluster analysis for the 2014 benthos survey in Swansea Bay (Figure 2). Table 2. Discriminating species between the main groups of samples of the 2014 benthos survey in Swansea Bay (SIMPER). 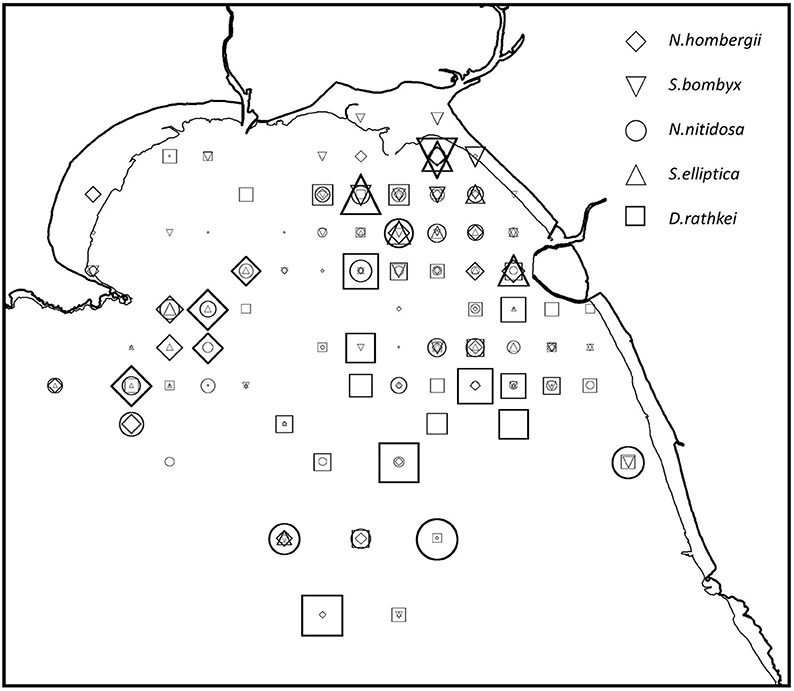 The third cluster was located inshore, characterized by typical lower intertidal to shallow subtidal species such as amphipods of the genus Bathyporeia and Nephtys caeca (Table 2). All other clusters did not have a discrete spatial identity but were interspersed within the other clusters. They were characterized by low numbers of species, which were sub-sets of the three other clusters; cluster 4 additionally contained Nephtys cirrosa, cluster 5 the polychaetes Magelona mirabilis and Owenia fusiformis. The spatial identity and distribution of the clusters was similar to 1984 (Figure 2): cluster 1 in 2014 and cluster D in 1984 both covered the eastern side of Swansea Bay; cluster 2 in 2014 and cluster C in 1984 were located off Mumbles Head; cluster 4 in 2014 was found in similar areas to cluster A in 1984. In 1984 samples had not been taken as far inshore as in 2014 and there were hence no sample positions that could be compared with cluster 3 in 2014. In 2014 too few samples were taken in off-shore areas to make a meaningful comparison with the area of the 1984 cluster B. There was considerable resemblance in the species composition of individual clusters between 1984 and 2014. Based on the pseudo F-test table published in Conneely (1988) the two studies had 26 species in common (Table 3); Conneely (1988) reported F-tests for 40 species but the full species list was not published for the 1984 study. It was therefore not possible to identify the exact number of common, missing and additional species between studies. Of the 26 species recorded in 1984 as well as 2014, 16 had significant F-values in both studies, and 12 species were found in highest numbers in matching clusters. Table 3. Indicator species of sample clusters in 1984 and 2014 (Figure 2) determined by pseudo F-test. Similar to 2014, in 1984 the cluster at the eastern side of Swansea Bay was characterized by N. hombergii, N. nitidosa, D. rathkei, and S. elliptica. Also, the largest number of species was reported for the cluster C off Mumbles Head; 32 of the 40 indicator species had highest abundances in cluster C (Table 3, approx. cluster 2 in 2014). These were mostly polychaetes, tube-dwelling species or sessile species such as Mytilus edulis. Nephtys cirrosa was the indicator species in the species-poor cluster A in 1984, which matched cluster 4 in 2014. 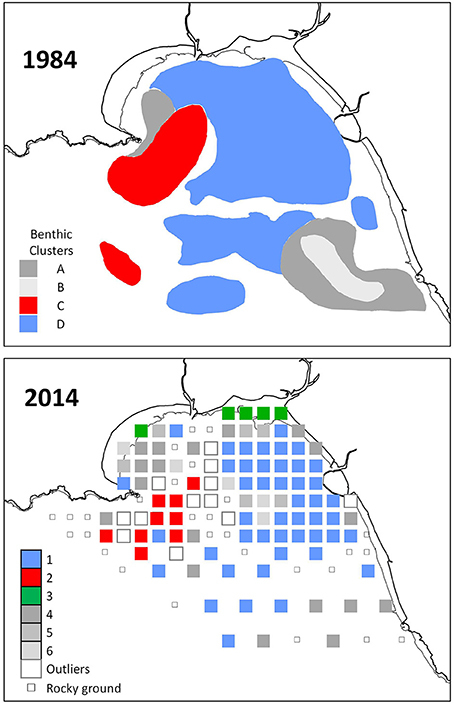 In comparison with 1984 the mean abundance of N. hombergii was lower on the eastern side of Swansea Bay in 2014. Conversely, the average density of N. nitidosa was higher in areas off Mumbles Head in 2014 compared with 1984; however, the species' distribution was generally patchy and standard deviations were high (Table 2, Figure 3). The difference in F-values for individual species in 1984 and 2014 supports that mean abundances in clusters differed between the studies. Further, some species were relatively abundant in the 2014 survey but were not reported for 1984, such as the polychaete Aphelochaeta marioni or O. ophiura. Figure 3. Distribution of species recorded in 1984 and 2014 which were identified by inverse classification as an association with similar spatial trends in both studies. The size of symbols represents the relative abundance of species in the 2014 study. Inverse cluster analysis identified 5 species associations in 1984 (Conneely, 1988) and 10 associations in 2014. Several associations had common species in 1984 and 2014 (Table 4). The greatest similarity (Sørensen Index) was found for the Nucula-association (N. nitidosa, S. elliptica, D. rathkei, N. hombergii, and S. bombyx). The species were mostly found in the eastern half of Swansea Bay and off Mumbles Head, broadly coinciding with sample clusters 1 and 2 (Figures 2, 3). Table 4. Similarity of species associations in 1984 and 2014 (Sørensen Index). Distance-based linear models (DistLM) allowed quantification of the degree to which one or more environmental parameters explained the benthic community structure in 2014; this analysis could not be carried out for the 1984 survey. The overall best model explained 35% of the resemblance in species richness and contained five variables (S: depth, mean grainsize, sorting, % coarse sediment and distance to sewage outfall). Of all entered variables “distance to the sewage outfall” explained most of the variation (6.3%, n = 101, p = 0.0032) in the data. The best model for the Nucula-association explained 22% of the variation and consisted of six factors: depth, mean grainsize, sorting, % coarse sand, % silt/clay, and distance sewage outfall; individually sediment sorting explained most of the variation (5.5%, n = 79, p = 0.0018). For the entire multivariate benthic community matrix containing all species, each of the entered explanatory variables was individually a statistically significant predictor of the multivariate community structure (n = 101, p < 0.005 for each variables), each explaining 2.6–5.6% of the variation in the benthic community (Supplementary Material S2). The overall best model explained 17% of the variation and contained five factors: mean grainsize, sorting, % coarse sand, distance to sewage outfall, and distance to rivers. 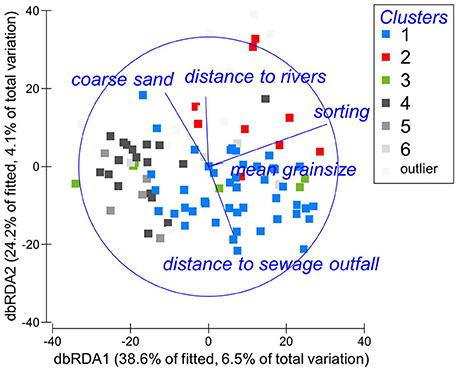 Individually sediment sorting explained most of the variation (5.6%, n = 101, p = 0.0001); distance to the sewage outfall explained 2.5% of the variation (n = 101, p = 0.001), and distance to rivers 2.4% (n = 101, p = 0.0023). The model is illustrated in Figure 4, where the dbRDA ordination of the benthic community is superimposed by explanatory variables. The dbRDA plot broadly groups the samples similar to the cluster analysis, at least for cluster 1. It ought to be noted that the dbRDA shows just 63% of the fitted variation and therefore captures only part of the model. Figure 4. dbRDA ordination of the fitted model for the benthic community of Swansea Bay, based on Bray-Curtis similarities after ln(x+1) transformation of abundances. Habitat characteristics significantly linked to the variation in the data are superimposed. The majority of samples indicated “moderate” or “good” environmental status according to the WFD classification (Figure 5). The IQI in the inner bay was 0.61 ± 0.08 (mean ± sd, n = 45) and 0.56 ± 0.15 in the outer bay (mean ± sd, n = 56). Both, the outer and inner Swansea Bay fell into the ecological status category “moderate.” In the inner bay one sampling location in the vicinity to the sewage outfall was classified as “poor.” Eleven samples classified as “poor” or “bad” according to the WFD were in proximity to the spoil disposal site in the outer Swansea Bay area (Figure 1). Figure 5. Water Framework Directive (WFD) classification of benthic infauna in Swansea Bay according to the Infauna Quality Index (IQI). It is a combination index based on three individual components: AZTI Marine Biotic Index (AMBI), Simpson's Evenness (1-λ′), and number of taxa (S). Over the past decades some benthic communities along European coasts changed markedly in response to sea-level rise, invasive species or eutrophication, while others remained relatively unchanged (Hinz et al., 2011; Schumacher et al., 2014; Singer et al., 2016). 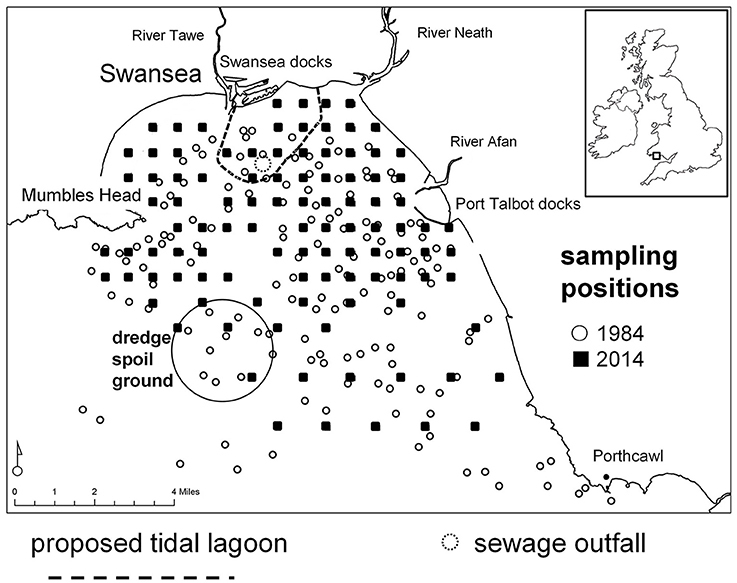 The benthos of the urbanized Swansea Bay in South Wales (UK) showed strong resemblance in 1984 and 2014, despite changes in anthropogenic use during the past decades. This study provided evidence of striking similarities in the species composition and spatial mosaic of the benthic fauna. Since the two surveys were 30-years apart it is possible that the communities experienced changes during the intervening years. However, published records from before 1984 tie in well with the surveys described here, which suggests that the results may not reflect ephemeral conditions but relatively persistent community patterns (Warwick and Davies, 1977; Harkantra, 1982; Shackley and Collins, 1984). Still, given the uncertainty regarding the nature of the community during the intervening 30 years the term “persistence” is used sensu Grimm and Wissel (1997). According to their definition “persistence” is a stability property that allows for temporal variation in an ecological system which remains essentially the same over time; in contrast, the term “constancy” describes a system that stays unchanged. In 1984 as well as 2014 a biodiversity hotspot was identified in an area further off-shore in mixed sediment and rocky grounds off Mumbles Head, a carboniferous limestone headland (Figure 2, Table 1). Reasons for the diversity-promoting conditions in that area were not obvious. Tidal flow velocities are exceptionally high around Mumbles Head where they are enhanced by an anticyclonic gyre, and generally tidal current speed and species richness are negatively correlated in sedimentary habitats (Warwick and Uncles, 1980; Rees et al., 1999; Pye and Blott, 2014). However, the current speed may not be the direct challenge for benthic species but rather the associated sediment movement (Warwick and Uncles, 1980). It is possible that off Mumbles Head high current velocities coincide with relatively stable substratum due to its mixed nature of glacial deposits and marine sediments with low sedimentation rates (Pye and Blott, 2014). This provides hard substratum and environmental conditions suitable for sessile species vulnerable to sedimentation and erosion. Further, tidal currents transport large quantities of plankton from the inner bay area. This favors suspension and filter feeders and would explain the diverse sessile polychaete fauna, including several tube-dwelling species as well as sipunculids and phoronids, leading to higher diversity and abundance than elsewhere in the bay. While overall community patterns persisted over time, there was evidence of changes in density of individual species. These ought to be interpreted with caution. In Swansea Bay densities of individual species change dramatically not just seasonally, but from month to month and annually, and these are therefore unlikely indicators for long-term changes (Shackley and Collins, 1984; Conneely, 1988; Smith and Shackley, 2004, 2006). In the 1984 and 2014 surveys a group of five species was prevalent: the bivalves N. nitidosa and S. elliptica, the polychaetes N. hombergii and S. bombyx, and the cumacean D. rathkei were grouped as species that showed overlap in their distribution (Figure 3). The species were found in both main benthic clusters and occurred in large parts of Swansea Bay. They are adapted to living in mobile sediments and coping with erosion and sedimentation, and it seems plausible that this group of species persisted over time because they can tolerate the rigor of the environment (Valentin and Anger, 1976; MarLIN, 2016). Their distribution was significantly linked to sediment properties. Generally, benthic monitoring can be onerous because of the taxonomic expertise necessary to identify large numbers of invertebrate species, and it may be possible to speed up the process by focusing on this group of species. This could provide a rapid indication of spatial change in the benthic community; it would though preclude conclusions about changes in biodiversity. Distance-based linear models indicated that the composition of the Swansea Bay benthic fauna was significantly linked with sediment properties, the proximity to rivers and the sewage outfall. The close relationship of benthic organisms with sediment characteristics has long been established (Gray, 1974), and in the Bristol Channel and Swansea Bay area faunal associations were shown to be directly related to tidally-averaged bed shear stress, which provided evidence for the physical control of the benthic communities (Warwick and Uncles, 1980). The broad spatial pattern of sediment distribution remained identical over the past 30 years (Harkantra, 1982; Pye and Blott, 2014). However, the 1984 and 2014 studies also highlighted that the traditional method of grab sampling to assess benthic fauna and substratum may not be entirely appropriate for an area with considerable glacial deposits, because the grab fails in rocky grounds. The coarse glacial material was not sampled representatively and some of the unexplained variation in the data is likely to stem from ignoring the impact of rocky substratum. Our understanding of the benthic ecology in areas with a mosaic of marine sediments and glacial till would improve by applying additional methods such as dredging and underwater video or stills. Further, the benthic models could be improved by more detailed, high resolution information about salinities in Swansea Bay. Distance to three rivers was a significant factor in explaining variation in benthic community characteristics, and it is possible that areas close to the rivers are at least temporarily subjected to full estuarine conditions (Heathershaw and Hammond, 1980). The sewage outfall was also significantly linked with the benthic community composition, suggesting that this point-source pollution affected the fauna. Invertebrates in heavily modified waterbodies in the vicinity of urban centers can be significantly impacted by an altered food chain, caused by higher nutrient concentrations from domestic and industrial sewage (Puccinelli et al., 2016). This can translate into a compromised ecological status, particularly if it is linked to oxygen depletion (Borja et al., 2009). However, while the distance to the sewage outfall was a statistically significant factor explaining 2–6% of the variation, it was generally part of a group of 5–6 habitat characteristics that best explained larger portions of the overall variation of the benthic community structure. The EU WFD water body classification suggests that Swansea Bay has “bad potential,” partly because of possible constraints in the distribution of invertebrates due to coastal defense infrastructure and diffuse source pollution. 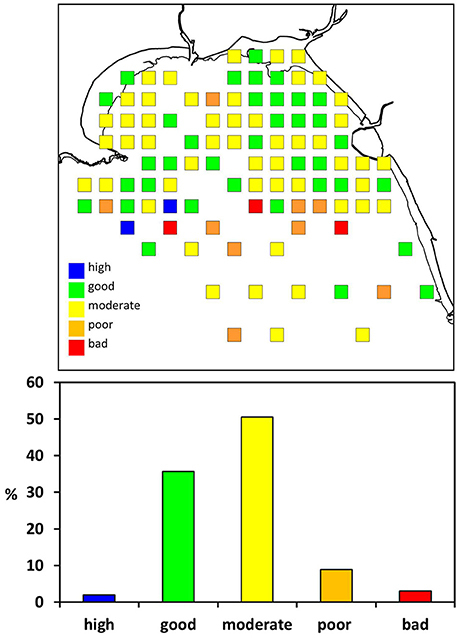 This study showed that in 2014 the average ecological status of Swansea Bay fell into the category “moderate” in terms of its invertebrate fauna. The inner bay in particular was predominantly classified as “moderate” or “good” ecological status (Figure 5). A single location in the inner bay was categorized as “poor.” The site was in close proximity to the current sewage outfall, which would be a plausible explanation for the poor ecological status (Borja et al., 2006). However, since this was just a single sample the result needs to be viewed with caution, and more replicate samples would be needed to verify the finding. Similar to the benthic community models, the WFD classification for the area would also benefit from more accurate salinity data. The impact of salinity on multimetric parameters is recognized and following from this the importance of geographical separation of areas according to environmental conditions when implementing the WFD (Fleischer and Zettler, 2009). This is however particularly challenging in a relatively small area such as Swansea Bay with spatially and temporarily widely fluctuating salinities. Eleven samples from the outer bay indicated “poor” or “bad” ecological status. A possible explanation is the vicinity of the dredge spoil ground, used to discard material from maintenance dredging of three shipping channels in Swansea Bay (Figure 1). The spoils may either directly impact the benthic community at the disposal site, or sediments may be transported over a wider area, explaining the west-to-east spread of sites with poor ecological status. Dredging and spoil disposal generally increases turbidity, changes sediment composition and mobilizes toxic materials such as heavy metals (Marmin et al., 2014). The nature of the impact of disposing dredge spoils on the benthic fauna varies with site specific environmental factors such as wave exposure and sediment dynamics (Roberts and Forrest, 1999; Bolam et al., 2010). The management of dredging and disposal of spoils would also be of relevance for new infrastructure projects, including the proposed Tidal Lagoon Swansea Bay, since maintenance dredging may be necessary after operation commences. With improving discharge management the risks decrease, but there is considerable uncertainty about the behavior of dredge spoils, and the impact on the ecology of affected areas merits closer investigation. There was little resemblance between the pattern of the WFD ecological status classifications and the benthic community patterns identified by multivariate community analysis. For example, the biodiversity hotspot off Mumble Head was not generally categorized as having high ecological status. 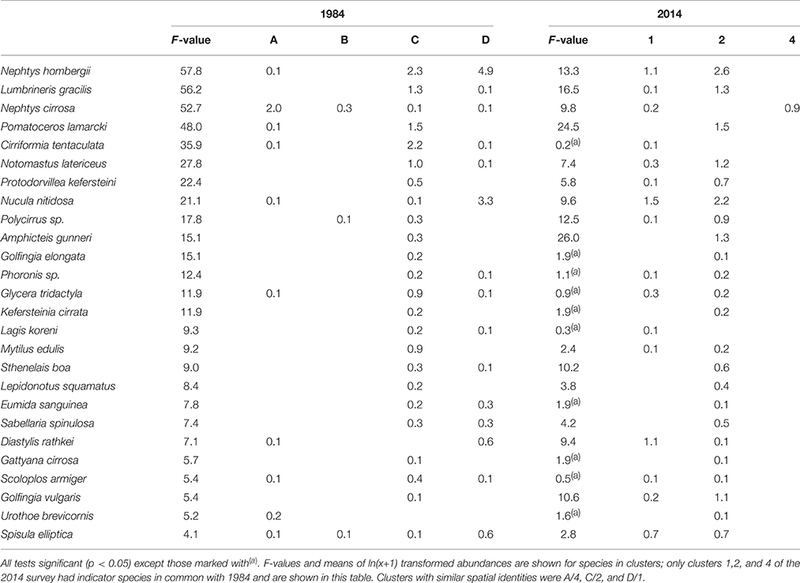 This precluded extrapolation of the 2014 ecological status assessment to 1984: while the broad benthic community patterns may have been similar in 1984 and 2014 it does not necessarily follow that the ecological status was similar too. Long-term studies of the sensitivity and robustness of benthic indicators to natural variability suggested that multimetric parameters such as the IQI will not just respond to anthropogenic impacts which they were designed for, but also to natural variation and disturbance, for example cold winter events and gradual changes in the climate regime (Kröncke and Reiss, 2010). They are however more robust against seasonal and interannual variability than univariate diversity indices. In the 1984 and 2014 comparison of Swansea Bay both natural long-term change as well as changed anthropogenic pressure was intertwined. Had there been significant differences in the benthic community structure, it would have been challenging to disentangle natural and anthropogenic effects. This highlights the importance of not only temporal reference conditions, but also spatial reference states (Borja et al., 2012). Although this study precluded analyzing temporal differences in ecological conditions, it seems plausible that the ecological status may have changed over time in Swansea Bay. For example, Conneely (1988) suggested that the 1984 benthic fauna was affected by high concentrations of heavy metals in sediments from industrial and sewage discharge (Chubb et al., 1980). In 1999 the sewage treatment and discharge location was moved from the western bay to its current central position (Figure 1), triggering a shift in benthic diversity from filter-feeders to deposit feeders in the immediate vicinity of the old sewage pipe (Smith and Shackley, 2006). Further, the start of a commercial mussel lay in the western bay led to a localized increase in carnivores and deposit feeders, but also to an overall decrease in species richness within the mussel bank (Smith and Shackley, 2004). While these changes in anthropogenic use seem not to have altered the broad community patterns over the past 30 years, they are likely to have changed the ecological status in pockets of Swansea Bay. The historical use of Swansea Bay highlights that the 1984 baseline did not represent a pristine state at which anthropogenic effects could be considered to be negligible (Collins et al., 1980). We know, for example, that about a century ago the area had thriving oyster beds (Shackley et al., 1980). Similar to other European stocks populations declined through overfishing, untreated sewage discharge, heavy metal contamination and shellfish disease (Laing et al., 2006). Despite improvements in water quality and the absence of commercial oyster dredging for decades, the stocks have not recovered, and hence, the anthropogenic activities a century ago may have changed the system beyond natural recovery. Further, coastal defense and infrastructure development in the bay severely modified the bay for over a century. Port Talbot Harbor or the Swansea Dockland/Tawe dredge channel create surrogate headlands which affect localized sediment movement (Thomas et al., 2015). This needs to be taken into account for environmental management, particularly when determining targets and reference conditions. This study provides further evidence of the value historical data can add to marine and coastal management, particularly if the repeat surveys are standardized to the historic methodology and complemented with contemporary techniques. On balance this approach maximizes the power of the comparison, although it may not capitalize on all currently available survey techniques. While this study emphasized the opportunities of historical data, it also grappled with limitations of using sub-standard information. The aspiration remains to determine meaningful reference conditions or baselines that can be repeated to track change (Borja et al., 2012). Generally this study highlights the importance to store raw survey data and make them available for future research in public archives. For the development of an infrastructure project such as the tidal lagoon in Swansea Bay this study offers a baseline of spatial benthic diversity patterns and provides information about key species and their relationship with the habitat. While significant environmental variables affecting the benthic community composition were identified, much of the spatial variation in the fauna remained unexplained. In order to improve models, more accurate and detailed information about freshwater input and salinities needs to be generated. The impact of glacial till on the benthic community needs attention, and this study suggested that for areas with a mosaic of marine sediments and glacial deposits traditional sediment property measures may be poorer indicators of the hydrodynamic regime than elsewhere. Direct values of current speed as well as wave exposure and sediment transport could improve the benthic models. Since the proximity of the sewage outfall was a significant contributing factor in explaining benthic characteristics, it would be advisable to measure oxygen concentration in sediments more accurately as a possible explanatory factor linked with nutrient enrichment. Importantly, this study suggests that dredge spoil disposal may affect the current ecological status of the benthic community, and future studies ought to focus on the behavior of dredge spoil disposals in the outer Swansea Bay in order to understand processes that may affect the benthic fauna. The comparison with a 30 year old baseline removed some uncertainty about the temporal variability of the benthic communities and confirmed that current associations are unlikely to be ephemeral but instead reflect persistent patterns. The severe natural environmental conditions in this heavily modified waterbody appear to have overshadowed localized changes linked with anthropogenic use over the past decades when assessing the area on a larger spatial scale. However, the 1984 baseline portrayed an already highly anthropogenically impacted situation as a result of industrial activities for over a century and did not represent a pristine ecological state. Historical data are therefore not necessarily suitable for setting future targets regarding the environmental status and for assessing if an area is as expected under prevailing conditions, as required, for example, by the Marine Strategy Framework Directive (MSFD, 2008/56/EC; European Commission, 2008). Such a task may be particularly challenging an areas such as Swansea Bay, which have been subjected to century-long anthropogenic impact. This paper highlights the importance of data accessibility and the author strongly supports public availability of raw data. The data of this study will be made publically available through an appropriate public archive once the paper is accepted for publication. The author confirms being the sole contributor of this work and approved it for publication. The study was part-funded by the EU ERDF project SEACAMS. The handling Editor declared a past collaboration with the author and states that the process nevertheless met the standards of a fair and objective review. I am indebted to everyone from the Swansea SEACAMS team who helped with the boat work on RV Noctiluca, in particular Keith Naylor, Chris Lowe, Ian Tew, Hanna Nuuttila, and Christine Gray. Chiara Bertelli identified the invertebrates in the benthos samples and Anouska Mendzil processed the sediment samples. Many thanks to Gill Lock from TLSB for her continuous cooperation and the discussions about the subject. Four reviewers made constructive suggestions during the revision process and greatly improved the paper. Anderson, M. J., Gorley, R. N., and Clarke, K. R. (2008). PERMANOVA+ for PRIMER: Guideline to Software and Statistical Methods. Plymouth, UK: PRIMER-E.
Chubb, C. J., Dale, R. P., and Stoner, J. H. (1980). Inputs to Swansea Bay. Industrialised Embayments and their Environmental Problems. A Case Study of Swansea Bay. Oxford: Pergamon Press. Clarke, K. R., and Warwick, R. M. (2001). Changes in Marine Communities: An Approach to Statistical Analysis and Interpretation, 2nd Edn. Plymouth: PRIMER-E.
Collins, M. B., Banner, F. T., Tyler, P. A., Wakefield, S. J., and James, A. E. (eds). (1980). Industrialised Embayments and their Environmental Problems. A Case Study of Swansea Bay. Oxford: Pergamon Press. Conneely, M. E. (1988). An Assessment of the Status of the Macrobenthic Infauna of Swansea Bay- A Report of the Studies Undertaken During the Period 1984-1987. Final report. Welsh Water Authority, Directorate of Scientific Services. Tidal Waters Report. TW 88/7 Vol. 1, 57. Culver, S. J., and Bull, P. A. (1980). “The Quaternary deposits of Swansea bay,” in Industrialised Embayments and their Environmental Problems. A Case Study of Swansea Bay, eds M. B. Collins, F. T. Banner, P. A. Tyler, S. J. Wakefield, and A. E. James (Oxford: Pergamon Press), 39–50. European Commission (2008). Directive 2008/56/EC of the European Parliament and the council establishing a framework for community action in the field of marine environmental policy (Marine Strategy Framework Directive). Off. J. Eur. Union L164, 19–24. Gray, J. S. (1974). Animal—sediment relationships. Oceanogr. Mar. Biol. Annu. Rev. 12, 223–261. Harkantra, S. N. (1982). Studies on the sublittoral macrobenthic fauna of the inner Swansea Bay. Indian J. Mar. Sci. 11, 75–78. Heathershaw, A. D., and Hammond, F. D.C. (1980). “Tidal currents and residual circulation in the Swansea Bay area of the Bristol Channel,” in Industrialised Embayments and their Environmental Problems. A Case Study of Swansea Bay, eds M. B. Collins, F. T. Banner, P. A. Tyler, S. J. Wakefield, and A. E. James (Oxford: Pergamon Press), 123–156. Phillips, G. R., Anwar, A., Brooks, L., Martina, L. J., Prior, A., and Miles, A. C. (2014). Infaunal Quality Index: WFD Classification Scheme for Marine Benthic Invertebrates. Environment Agency. Pye, K., and Blott, S. J. (2014). Tidal Lagoon Swansea Bay: Sediment Sources and Depositional Processes in Swansea Bay. Natural Resources Wales. Report No. KPAL 16033, Kenneth Pye Associates Ltd, Solihull. Shackley, S. E., King, P. E, and Rhydderch, J. (1980). “Fish and fisheries in greater Swansea Bay,” in Industrialised Embayments and Their Environmental problems. A Case Study of Swansea Bay, eds M. B. Collins, F. T. Banner, P. A. Tyler, S. J. Wakefield, and A. E. James (Oxford: Pergamon Press), 555–563. Copyright © 2016 Callaway. This is an open-access article distributed under the terms of the Creative Commons Attribution License (CC BY). The use, distribution or reproduction in other forums is permitted, provided the original author(s) or licensor are credited and that the original publication in this journal is cited, in accordance with accepted academic practice. No use, distribution or reproduction is permitted which does not comply with these terms.